There are great many awards in the world. Collecting them is one of the amateur hobby pursuits. Moreover, several awards program server as indicator of the levels attained by the applicant. However, any existing and successful award program, has some disadvantages. We are attempting to clean up the negatives with our diploma program. 4. Increase the ‘value’ of radio stations operating from large countries, like Asiatic and European Russia, Canada, Brazil and China. This would encourage hams to go on expeditions there and operate ‘field days’ form the areas with low density of ‘ham population’. 6. The program aims to simplify accounting for participants’ achievements. ADIF logs would be processed through website interface (of any type log). Participant’s ratings will also be published there. 7. Award itself would serve not only as a proof of attained results, but also a true eye-catcher. Given the above, it is obvious that QTH locators and sectors meet the goals of the program most fully. Participants’ results are tabulated by sectors and large quadrants. 1.2 The highest achievements of almost all award programs are honored with plaques that could be proudly placed on the shack wall. But normally it takes years or even decades to obtain the highest achievements and meanwhile paper certificates which reflect ham’s current ones usually are buried in some drawers. Instead even the initial certificates of the MY WORLD program, as basic as continental ones, are nice looking plaques. As the participant attains additional confirmations of sectors worked, and sectors worked by band, paper awards would be issued, along with the metallic ones which are mounted on a plaque, displaying the level attained by the awardee. II Modern structure of QTH-locator. 2.1 Earth entire surface is divided into 324 sectors, 10 degrees of latitude by 20 degrees of altitude each?. Sectors are marked by 2 Latin letters, from AA to RR, inclusively. A total of 18 letters are used. Letters S-Z are not used. Each sector is divided into 100 large ‘quadrants’ measured 1 degree of latitude x 2 degrees of altitude (approximately 78 x 111.4 km), the are designated by numbers – from 00 to 99 Large quadrant is divided into 576 ‘small quadrants’, 2,5 x 5 ? minutes (approximately 4.6x 6.5 km), designated by lower-case Latin letters. Only letter a through x are used, y and z – are not used. 2.2 MY WORLD keeps track of participants’ achievements by sector by band. Program’s website automatically tracks ratings by large quadrants, regardless of the band and mode. 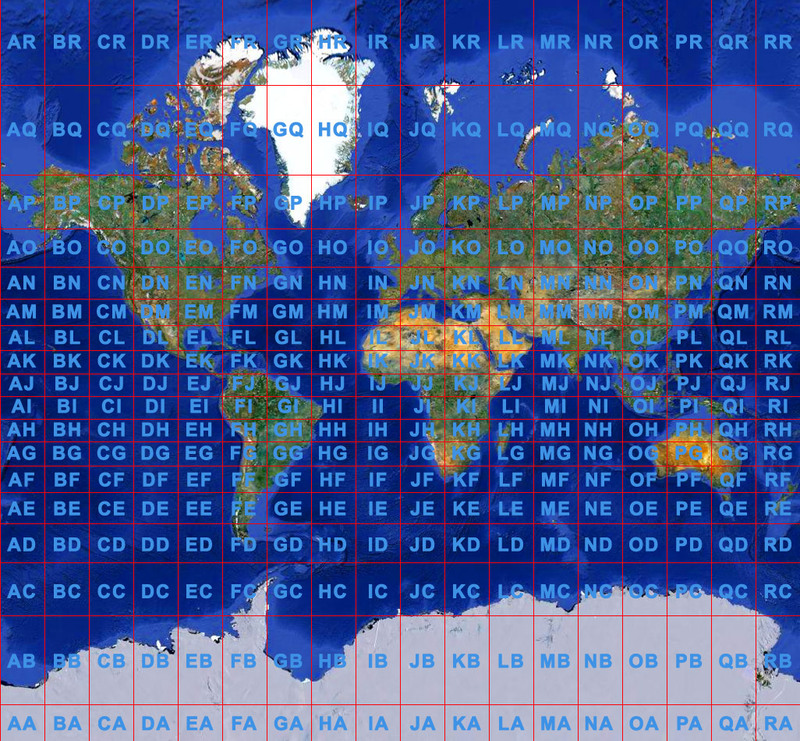 We recommend that you log QTH locator (grid locator) of your correspondent. When your ADIF log is imported to our site, we can automatically reflect your call and it’s standing in the rating. We have separate ratings, by sectors and quadrants. 2.3 Annually, on May 7th, (celebrated as Radio Day in Russia) we tally the results of the ‘square hunters’. Top three are awarded plaques and diplomas and their awards are shipped to them free of charge. All participants, who previously received the Challenge diploma and are rated among the Top Ten, are invited to participate. Every March, award program manager, mails letters to Top Ten square applicants. Applicants are requested to present 20 QSL cards (from one’s collection) for verification, so a winner can be chosen. Once they determine that QSL cards presented have no blemishes, the winner is declared based on largest number of confirmed squares and the 1st place in the ratings. Each QSL card not accepted subtracts 5% from the final result. Only 15% reduction (3 ‘bad’ QSLs) is permitted. Once the number of disqualified cards becomes > 3, the applicant is also disqualified from the program for one calendar year. He can, if he wishes, to make corrections, and re-enter the program, commencing on June 1st of next year, by providing a corrected log. Other program participants can have disqualified squares removed from their logs under the same rule (1 ‘bad’ QSL = 5% score reduction). The competition winner of the corrected rating is awarded a plaque. Second and third place winners – silver and bronze diplomas. Remaining 7 participants get MWA Laureates Award for a given year. 2.4 When requested cards are not provided by May 1st of the current year (no matter what the cause), the participant is automatically placed into the rating position #11. He has a full year to submit the cards for verification. Once verification is completed, he will, once again, attain the position based on the number of his confirmed squares. But he loses an opportunity to capture one of the Top Ten spots in the current year. Future verification non-participation will disqualify him again for one year. This measure is implemented to maintain individual integrity of the participants. 3.2 Each award is a solid wood plaque, with special seats, where metallic medals may be mounted. Plaques have distinct colors and shapes, reflecting achieved level of each MY WORLD award. 3.3 Basic award MY WORLD is a solid wood plaque, in a form of a shield, 270 x 370 mm It is issued for 2-way contacts, any mode, made on these bands: 160, 80, 40, 30, 20, 17, 15, 12 and 10 meters, with amateur radio operators in 100 separate world sectors. Basic award is issued with ‘bronze’ patch for 100 sectors, made of metal with respective color coat. For those attaining 200 and 300 sector levels, paper awards MY WORLD – 200, MY WORLD – 300 will be issued, together with metal ‘silver’ and ‘gold’ patches, to be mounted on the plaque itself. 3.4 Continental awards MY WORLD is a square solid wood plaque, 230 x 330 mm. It is issued for 2-way contacts, any mode, made on any of the next bands: 160, 80, 40, 30, 20, 17, 15, 12 and 10 meters, with amateur radio operators located in different sectors of a continent. Basic continental award is issued with ‘bronze’ patch for contacting 30% of existing sectors. The patch is made of metal with respective color coat. When the applicant achieves contacts with 50% and 100 % of all sectors, additional paper awards are issued: CONTINENT – 50%, CONTINENT – 100%. The word ‘Continent’ in the award title is replaced by the name of the respective continent - AFRICA, ANTARCTICA, ASIA, EUROPE, NORTH AMERICA, OCEANIA or SOUTH AMERICA. The Award is issued with metal ‘silver’ and ‘gold’ patches for 50% and 100% of sectors respectively, to be mounted on the plaque itself. One-band continental award is issued as CONTINENT 160 BRONZE, CONTINENT 160 SILVER, ... CONTINENT 10 BRONZE, CONTINENT 10 SILVER, CONTINENT 10 GOLD. The awards are accompanied by medals made of metal, with appropriate form and color (‘bronze’, ‘silver’, ‘gold’) for 30, 50 and 100% of continent sectors, on a given band. Patches are mounted on the plaque itself. The list of continent’s sectors and the number of sectors making up 30, 50 and 100% of a given continent needed for ‘bronze’, ‘silver’, ‘gold’, MIX and by band are shown in tables. Applicants must take note that some continental sectors extends to other continents. For example, EJ sector covering Costa Rica and Panama is in North America, and NW coast of Ecuador and the Island of Marchena (SA-004) are in South America. These kinds of ‘double-sectors’ must be additionally checked when applying for awards and corrections made as necessary. Contacts with maritime …/MM stations count for any missing continent in the given sector. 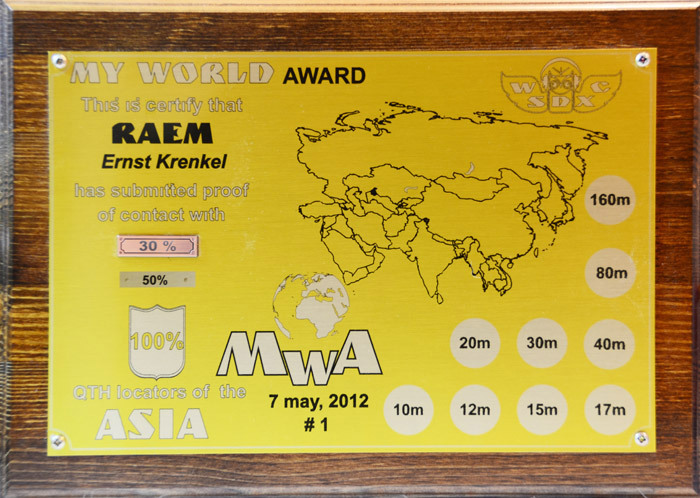 3.5 CHALLENGE AWARD is a solid wood plaque, in a form of a shield, 270 x 370 mm It is issued for 2-way contacts, any mode, made on these bands: 160, 80, 40, 30, 20, 17, 15, 12 and 10 meters, with amateur radio operators located in various world sectors. Each sector contact gives 1 point for award. 3.6 5 Band MY WORLD Award is a solid wood plaque, in a form of a shield, 270 x 370 mm. It is issued for 2-way contacts, any mode, made on these bands: 80, 40, 20, 15 and 10 meters, with amateur radio operators located in 100 separate world sectors worked on each of the 5 bands. 3.7 6 Band MY WORLD Award is a solid wood plaque, in a form of a shield, 270 x 370 mm. It is issued for 2-way contacts, any mode, made on these bands: 160, 80, 40, 20, 15 and 10 meters, with amateur radio operators located in 100 separate world sectors worked on each of the 6 bands. 3.8 7 Band MY WORLD Award is a solid wood plaque, in a form of a shield, 270 x 370 mm. It is issued for 2-way contacts, any mode, made on these bands: 160, 80, 40, 30, 20, 15 and 10 meters, with amateur radio operators located in 100 separate world sectors worked on each of the 7 bands. 3.9 8 Band MY WORLD Award is a solid wood plaque, in a form of a shield, 270 x 370 mm. It is issued for 2-way contacts, any mode, made on these bands: 160, 80, 40, 30, 20, 17, 15 and 10 meters, with amateur radio operators located in 100 separate world sectors worked on each of the 8 bands. 3.10 9 Band MY WORLD Award is a solid wood plaque, in a form of a shield, 270 x 370 mm. It is issued for 2-way contacts, any mode, made on these bands: 160, 80, 40, 30, 20, 17, 15, 12 and 10 meters, with amateur radio operators located in 100 separate world sectors worked on each of the 9 bands. 3.11 HONOR ROLL Award is a square solid wood rectangular plaque. It is issued for 2-way contacts, any mode, made on these bands: 160, 80, 40, 30, 20, 17, 15, 12 и 10 meters, with amateur radio operators located in 310 separate world sectors. Plaque is issued with ‘bronze’ patch for 310 sectors, made of metal with respective color coat. For those attaining 320 and 324 sector levels, paper awards HONOR ROLL-320 and HONOR ROLL # 1will be issued, together with metal ‘silver’ and ‘gold’ patches for 320 sectors (silver) and all sectors respectively to be mounted on the plaque. 3.14 MY WORLD award committee reserves the right to request any QSL cards listed in the application for verification. 4.1 All awards of the program except 5В, 6В, 7В, 8В and 9В are available to the activators. Awards’ numbering sequences and achievement levels for the activators are kept separately from the rest of the applicants. Each sector and large quadrant credits an activator when he makes no less than 100 QSOs from the given territory. For band awards QSOs must be conducted on selected band. To received basic, continental, band (for any continent) and HONOR ROLL award the activator must complete award terms with 1:10 ratio. The obtained fractional result will be rounded to an integral value according to math rules. Eg. the Basic Award will be issued for 10 confirmed sectors, the Bronze Antarctica one for 2 sectors, the Gold Asia for 7 sectors and so on. - for radiomen of river and sea-going vessels – additionally – vessel’s name, beginning and ending dates of the trip, trip waypoints (route). 4.4 Award application should be submitted in any format, when the above supporting documentation is provided. To validate operation from any territory or quadrant, MY WORLD Award Committee reserves the right to request additional information, confirming operation from the area in question. These include, but not limited to: video and photo, GPS logs or images showing coordinates and any other information verifying the same. This requirement is a MUST when operating from sectors with 0-rating of the Most Wanted (i.e. no prior operations). Awards can be paid by PayPal on e-mail: mwaward73@gmail.com, or simply click on the ‘Pay’ button, located on the lower portion of any application page. .. :: Foto gallery :: ..